The TheraMind® Center of Skokie is under the Medical Direction of Dr. Dawna Gutzmann and offers a broad range of non-invasive and non-drug treatments for mental health issues including Transcranial Magnetic Stimulation (TMS) therapy for depression, anxiety disorders, PTSD, OCD and Bi-Polar Disorder, among others. The Center is conveniently located in comfortable, modern offices at Route 41 North and Old Orchard Road with free parking at the Center. TheraMind® Services is a leading national provider of outpatient neurological and psychological treatment services including Transcranial Magnetic Stimulation (TMS) therapy. Our independent, state-of-the-art, neuropsychiatric service centers are dedicated to offering all mental health professionals, referring medical doctors and their patients one of the most advanced options for treating Major Depressive Disorder, Postpartum Depression, anxiety disorders including OCD, PTSD, General Anxiety Disorder and other mood disorders. Many of our Centers also treat a broad range of neurological disorders including Migraines, Chronic Pain, Fibromyalgia, Tinnitus, Concussion and TBI and Stroke related disorders. TheraMind Center of Skokie works with prescribing physicians to design a treatment program tailored to the individual needs of each patient. Under the supervision of our Chief Medical Officer and Medical Directors, our TMS Specialists provide a safe, non-invasive and effective outpatient procedure that has helped thousands of patients who have not responded well to drug therapy. 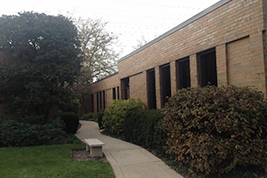 Our Skokie TMS therapy center proudly serves patients in the Skokie, Morton Grove, Niles, and Evanston area. Dawna Gutzmann, M.D. has over 20 years of private practice experience in treating the mental wellness challenges of patients. She graduated from the University of North Dakota School of Medicine and trained in psychiatry at Northwestern University School of Medicine. After studying the available, non-pharmacological alternatives, Dr. Gutzmann determined to offer patients TMS therapy because, unlike traditional drug therapies, it is targeted only to the specific regions of the brain involved in mood regulation and is free of side effects. To learn more about the disorders we treat here at TheraMind® Center of Skokie, visit our Treated Disorders section of our site or call us today at (847) 562-5868. TheraMind Offers Hope. Get the Results You’ve Been Looking For—CONTACT US NOW!